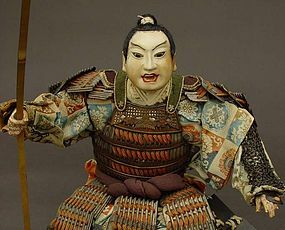 Scruffy looking old Japanese warrior doll (musha ningyo). This doll is not so tall (11 1/2" tall) but heavily padded, solid and quite heavy. When we acquired this doll, his hair was already replaced once and most of it was; one side is painted in black. Old glass eyes. The checker design (ichimatsu design) on his clothes is very similar to "Enshu-donsu", one of the famous fabrics used for tea ceremonies in the Edo period. 11 1/2" high x 11" wide x 12" deep. Circa Meiji (1868-1912).